Are You In A Battle That Needs A Great Reward? We face spiritual battles daily but are you entering them unprepared? Kerryn shares. “After this, the word of the Lord came to Abram in a vision: ‘Do not be afraid, Abram. I am your shield, your very great reward'” (Genesis 15:1). Are you scared, lonely, hurting, worried about the future? We all experience this, but there’s something we can do! Have you ever thought about how tough it was in battles in the Bible? Men were fighting, literally to the death. Their shield was their protection from wounds, pain and death. – One could be held on your arm and maneuvered for close combat to protect from a sword’s painful blow. – The bigger shield was about 4 feet high by 2½ feet wide made of wood, covered in leather and bound with iron. A protective wall was made by soldiers standing shield to shield to protect them from flaming arrows. Imagine not bothering to use a shield in combat! Yet that’s what I often choose and you do too! Crazy! God tells us at the beginning of the Bible that He is our shield and our “very great reward.” It was a message to Abram, who was worried that the four kings that he and his men fought to rescue his nephew Lot, may retaliate. In the New Testament Paul tells us to “take up the shield of faith.” This is active and something we can do. The shield of faith is enacted through prayer, worship, reading the Bible, and trusting God. If you’re in a huge battle you need other Christians to place their shields next to yours in prayer. Do you need someone to pray with you? Ask at the end of this devotional. Prayer: Lord, the battle is raging in my body and around me. Help me to choose to faithfully “take up” the shield of faith and to ask others to pray for me when I’m in tough battles. Thank You for being a “great reward” for me daily. Amen. In what ways are you choosing to go into the normal battles of the day without God’s shield of protection? What could you choose to do to cope better with the daily battles? Filed Under: Devotionals, Fear, Finding Purpose, What's New? 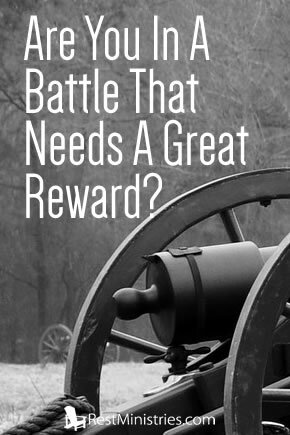 23 Responses to Are You In A Battle That Needs A Great Reward? I REALLY needed to read this today! I’m thankful that God timed this to help you today. Thank you for posting this Kerryn. Three years ago I began presenting with health issues; (pelvic floor mostly), that are not improving, and the Drs don’t know why. I’ve had mri’s and ct scans, etc, etc..
..the reality is that we’re all going to die. Some are more fortunate than others when it comes to luck and genes,(Ecclesiastes)..
I’m perplexed though when it comes to knowing or trying to manage/ understand this dilemma. …consequence of sin? …spiritual warfare? …bad luck? I guess I’m needing reassurance that he hasn’t abandoned me due to some unforgivable sin, or that even though I haven’t a clue- (as well as my medical team), that He still is at work on me working out his plan…? Oh well.. thank you again for this post. God bless and keep put he good work. WOW! You’re sure dealing with a lot right now. Know that you’re not abandoned by God & He loves you! I think we all struggle to understand at times why things go wrong in our bodies, but they would have worked perfectly before “The Fall” when Adam & Eve chose to sin, which now affects us all! We would be in trouble without our shield of faith. I need prayer for the next few hours. I HAVE to be up and somewhere tomorrow at 10:30. That may not seem early, but for me it is going to be very tough. Please pray that i can sleep. It is 9pm here now. Thanks! Dear Chris, as I live in Australia our time zones are really different to yours, so I have no idea what time it is there now. However, God doesn’t worry about times, so my prayers now are used by Him in your past, present & future! Great picture of how faith is such a shield for us and I love the idea of standing alongside eachother with our shields lined up so no arrows can get through. Thanks for all the times you’ve been alongside me – praying and standing beside you now! Yes, that image of us all “standing alongside each other with our shields lined up so no arrows can get through” was HUGE for me too! Suddenly it was abundantly clear how powerful we all are with our shields of faith blocking the enemy’s arrows! No wonder he panics when we all pray faithfully together! Woo hoo! Thank you Kerryn and God bless you. You always bring a breath of fresh air to my understanding of God’s Word and the application to life. The application of Ephesians 6 and the shield of faith is perfect. Opposite of fear is faith and vise versa 🙂 we are like the Isralites on the way to the promised land and would rather go back to Egypt for the Veggies. I’m sooo encouraged by your comments. I praise God that He continues to surprise me with His revelations to share. This one came during my retreat time when the Sunroom closed. I love how God reveals sweet mysteries to us when we choose to sit at His feet. A good reminder of God’s care for us, Kerryn, and a good time to receive it. My wife and I could use some prayers. We need for bancruptcy to go through without problems, and have health issues we’re trying to deal with. My wife continues to be easily fatigued and have breathing problems following a bout with pnuemonia during the fall, and I’m having problems with an aching shoulder/arm and dizziness of late. Thanks for your message and prayers. Lord, please ease their health & the path through bankruptcy to surprise them with blessings along the journey. Bring improvements to their health through avenues that surprise them. Through it all draw them closer to You & to each other. Amen. GOD. SHIELD OF FAITH. It is a matter of the future like Abraham no child. It’s always special to see you commenting on the devotionals. It seems that God keeps giving me lessons on trusting Him & living by faith. It’s my joy to share them with you & I’m thankful that it encouraged you. What a great reminder for us all to put on our armor! We are in a battle every day and our shield is vital to extinguish the arrows of the evil one. Kerryn, so awesome to think of us all standing side by side holding up our shields!